This is my new home – I have now left my Blogger account and settled here. As I explained before, this was for various reasons; I had intended to switch a long time ago but never got around to it, but recent comments on my old blog were making me feel too paranoid to continue blogging there, so rather than make that blog invite only, I decided to switch to here where I can just password protect certain posts if I feel the need, although I hope not to have to do that often. I am still finding my way around – I haven’t got a blogroll on here yet for example, but that will be sorted in time. So yes, this is my new home. If you have me on your blogroll I would appreciate it if you could change it to this address, as this is where I will be from now on. I will post a proper update with what has been going on over the last couple of weeks later today. I am no longer going to be blogging here – I am making the move the WordPress. This is primarily so that I can just password protect certain posts if I feel the need to, rather than my entire blog being invite only. My Twitter and Facebook accounts will remain the same, as will my email address. I am currently finishing setting things up, and will let people know the link soon. Hopefully when I have finished setting it all up I will get back to blogging regularly, as I have found I have missed it, and I think perhaps not having that form of support contributed to a further slip in my mood, but to be honest I don’t know that I could have written much anyway due to my mood. I will fill you in on what has been going on over on the new blog, hopefully later today. I need to blog. I am finding it hard not having it as an outlet and I miss it. But right now I can’t do it in public in the way I always have done, as I am too paranoid about what people are thinking of me etc, so I have made the decision to make it invitation only. I am kind of upset about this, as to me it takes away one of the core things I like about blogging – that absolutely anyone can stumble onto your blog and start reading, and I have grown close to several people through this blog, who I obviously wouldn’t know at all if my blog had always been private. But for the time being that is the plan, and hopefully at some point in the future I will go back to open blogging. If you would like to continue to read then please either send me a DM on Twitter, a message on Facebook, or an email, with the email address you want me to send the invitation to. Please do not ask for an invitation if you think I am attention seeking/crying wolf/give BPD a bad name, or any of the other things I have been accused of lately – I can’t think why you would be reading my blog in the first place if you feel like that, but clearly people do. Thanks. >So I have my appointment with L later. I am not feeling remotely positive about it. I can’t see an outcome that could improve things or make me feel any more positive about anything. I feel like it is going to be a difficult appointment for both of us – she is going to be frustrated by me because I don’t feel able to do simple things like get dressed and go out for walks daily, and eat regular meals, and improve my sleep, and I am going to feel useless because I can’t do any of those things, and frustrated with myself for being so pathetic, and with her for not being able to do more, which I know is unfair, but I just feel so horrible. I seriously considered not going to the appointment. Not just not turning up, because I don’t do that, but cancelling – I am not sure whether for her sake or mine, or both. I did actually send her an email in the afternoon to that effect, saying that I was concerned it would be frustrating as she would want me to do things that I don’t feel able to do, and I didn’t want to make things tense, or to frustrate her, or make me feel worse. She replied that she thought we should talk about the options, and so would be happier if I kept the appointment, so I will go. I am worried, and I think not without reason, that she is going to stop seeing me. She talked last time about how if I am feeling this bad she obviously isn’t helping, and maybe she is either taking a wrong approach, or she is the wrong person to be working with me at the moment. I have a strong suspicion that she may suggest we either take a break from sessions, or that she will pass me to another member of the team. I know I must be immensely frustrating at the moment, and based on the last time I saw her I just wouldn’t be surprised if something like that happens. I will just have to see what happens I suppose, but I really won’t be shocked if something along those lines does come up, particularly given what she said about talking about the options, as I am unsure as to what else she could mean by that. I feel like I am letting her down at the moment by not being able to do the things she wants me to. It has been yet another difficult night. It begun by me getting a bit upset by some comments I received regarding this blog. I was told amongst other things “Sorry Bip but your self-pity and self indulgence is starting to grate. And, ‘Madospherites’, i do know what I’m talking about (more than most of you cyan imagine) don’t come back at me with self-indulgent drivel.” I was quite hurt to be honest. I suppose it touched too close to home to what I worry people will think of me, and what I think the professionals might be thinking of me. The thing with this blog is that although I do really appreciate all of the comments and support I receive through it, I write it for me. I write it because I am encouraged to write about my feelings and thoughts, as it helps me, and I like using blogging to do that because it allows me to connect with others. I don’t write in order to garner sympathy or pity. I write whatever I am thinking at the time. But to be honest this has made me consider taking a blogging hiatus, at least whilst this particularly bad episode persists. Although I would continue to write, as I need to do that for me, I may not publish anything for a while, although I will see how I feel. I never wanted my blog to turn into one long moan, and essentially it has, and I don’t want people to think of me as a continuously negative person who just whines non stop. I do not want people to reassure me regarding this because they don’t want to hurt my feelings by telling me how dull and whiny I am, I honestly don’t. So I am considering a blogging break. I will post later to say what happens with L, but I will see how I feel after that. If I continue to write, and you do think I am whiny and need to get over myself, please just stop reading. I don’t want anyone to read out of a sense of obligation. If you are a friend and feel like you should read so you know what is going on in my life, but find my writing grates, then just stop – I honestly don’t mind. This is primarily for me, and whilst I have met some fantastic people through this blog, who I now consider friends, I don’t want anyone to read if they don’t want to. I really am fully aware that I am difficult and frustrating at the moment, probably to professionals and friends alike. I appear to be in an incredibly deep depression, that is certainly amongst the worst I have ever experienced, if not the worst, and despite time passing, it isn’t easing at all. If anything, I seem to be feeling increasingly hopeless. I suppose it could be seen as fortunate that things have been as bad as they have. I have had so little energy and felt so terrible that the vast majority of my time seems to be spent either asleep (although I am not getting much sleep), just lying in bed feeling paralysed and so completely unable to do anything, or just somehow disappearing without me even really realising it – I suppose through dissociation. It literally sometimes takes me an hour or two to manage to get myself out of bed when I need the toilet (although I was also told “No-one is literally unable to get out of bed unless they are physically disabled”). I have no appetite most of the time, although I am forcing myself to eat anyway, although not regularly. To be honest, I feel almost certain that if I had slightly more energy I would have attempted to kill myself by now, but despite the thoughts constantly churning around in my head, I just feel too exhausted to act on them. It always strikes me as somewhat ironic that you can be too depressed to kill yourself. Plus I have genuinely been trying to get by for the sake of those who care about me, despite not wanting to, and so I have been putting whatever energy I have been able to find into asking for help when I feel like I need it, although it has proven to be fairly futile on the whole, writing here to try and clear my head, and trying not to cut myself off from people completely, which is certainly tempting when I feel like this. I have been making a lot of effort, although it evidently doesn’t appear that way to some people, but I know how I feel, I know the thoughts I am having to contend with on a daily basis, and I know how desperate I am, and how strongly I feel I don’t want to be here, and although that may mean I am coming across as self pitying and self indulgent, (and perhaps I am these things) I am doing absolutely everything I feel able to do at the moment. I am still alive, and although I think that is largely due to the extent of my depression, I suppose I have to view it as an achievement, despite it not feeling like one. So where from here? I don’t know right now. I suppose I go to my appointment this afternoon with L, and try to be honest about my feelings, despite knowing it isn’t what she wants to hear. And then, who knows? I will blog following my appointment, which to be perfectly honest I am already dreading, and after that I will make a decision about whether I want to continue to blog at the moment or not. And life generally I guess. Que sera, sera. 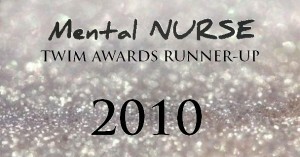 >I am rather late with this, but it is time to display and show off about my shiny thing of shininess, as awarded by Mental Nurse. I won this in the annual TWIM awards, for being runner up in Best Personality Disorder Blog. I was amazed to receive so many nominations, particularly given that I am in the same category as Pandora, who is the author of what is, in my opinion, one of the best mental health blogs around, and who rightfully won the category. I am always shocked that people even read the drivel that I write on here, as essentially I just come on here to brain fart – I don’t have a wonderfully articulate, well written, thought through blog like lots of other people do, and even after writing it for a year it still surprises me that people make the effort to comment on what I write, and the nominations I received for the TWIM awards were even more surprising. So thank you to everyone who voted, and thank you to everyone who comments or reads – it all means a lot to me. Congratulations to all of the other winners in all of the categories – many of my favourite blogs scooped awards, and lots of others received nominations – there is a full list of winners here for anyone who wants to check out some of the other brilliant blogs. As I said recently my blog, and the rest of the Madosphere, has come to mean a lot to me over the last year, and has been one of my biggest sources of support, so thank you for that. I genuinely don’t know where I would be without all of the support I get from this blog, and people I have met through writing it. Winning an award for something that has helped me so much almost feels wrong, as I write for entirely selfish means, but I appreciate it very much.